When Cold Spring Brewing retired Gluek Beer in 2010, after decades of the brew passing through different ownership hands and struggling to survive, the company had lost hope for the historic label. So Holcomb, whose family connection to the legendary lager dates back to prohibition, took matters into her own hands. In 2015, she obtained the trademark and copyrights for the 160-year-old beer. Then she found a German chemist to rewrite the recipe and enlisted a Denver brewing company to handle production. On Friday, she’ll be reintroducing Gluek Beer to the public, re-releasing the suds on its would-be 160th anniversary. “This beer has a real history,” Holcomb. “It was the first manufacturing company in Minneapolis. It was the first to patent malt liquor in the U.S. It was one of just three breweries to supply beer to the U.S. Army in World War II. “They really were pioneers … What I’ve done is restore the original intention of [founder] Gottlieb Gluek." Holcomb's history makes her as qualified as anyone to make that determination. Her great grandfather, Charlie Fransen, was “the right hand man” of the Gluek family, who had emigrated from Germany, helping with matters at the brewery and on their farm. Later, Fransen opened what is now Gluek’s Bar in downtown Minneapolis – at midnight on the night that prohibition ended, with a line of people waiting outside to pile in. One of their most popular brews? Gluek Beer. Holcomb – who now is also an international yoga and nutrition teacher – began working at the bar as a hostess at age 14 and worked there on and off until just two years ago, taking time off for college, travel and starting her own merchandizing company. After Gottlieb Gluek passed away and the brewery was destroyed in a fire, the rights were sold and bounced around from company to company for several decades. Along the way, Holcomb believes, the recipe was tainted. Where the original 44 recipes are hidden is still a mystery – Holcomb calls them her “Holy Grail” – so after purchasing the brand, she enlisted St. Paul’s BevSource, which helped her find Ray Klimovitz, a German chemist living in Wisconsin, who wrote a new recipe. Sleeping Giant Brewing Company, in Denver, is handling the production. The result is a beer distinct from its most recent predecessor, Holcomb says: a clean, crisp, sessionable pilsner. 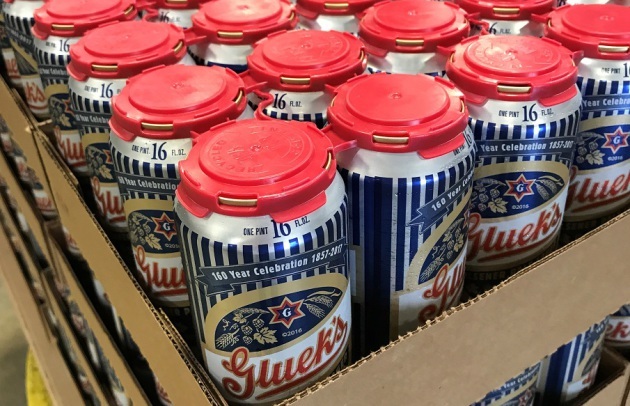 The can – with dark blue stripes and "Gluek’s" written in cursive red lettering – is based off the original with Tom Jahnke, the son of the original designer, uncovering the old art files. Beginning Friday, thirsty beer drinkers should be able to find Gluek’s in restaurants, bars and liquor stores around the state. Holcomb is also targeting casinos, ballparks and hopes to eventually reintegrate Gluek Beer in the 27 states where it was once distributed. “It’s been a slow, methodical process,” Holcomb said. “But the more obstacles placed in front of me, the more I’ve been inspired to leap over them. "It's been serendipity how it's all come together."